It’s that time of year when a drive past home and garden centers gets my own amateur landscaper’s heart racing! I feel a surge of enthusiasm to plant something – anything – as I peruse the aisles of brand new, vibrantly colorful flowers, fluffy green ferns, and musty, aromatic bags of soil on display. Do you hope your yard will stand out and catch the eye of those who drive or walk by? Place flowers and beautiful green foliage in flower beds around shrubs, arrange hanging baskets flowing with cascading fronds, and fill containers with flowers and greenery. These touches really make your yard get noticed. It’s difficult to give them up, but it’s time to remove those beautiful, full-bodied pansies (and leggy cabbage) you planted during the winter and replace them with hardy, hot-weather plants. Most seasoned gardeners say in order to reap success, follow the plant’s label instructions and keep it watered. 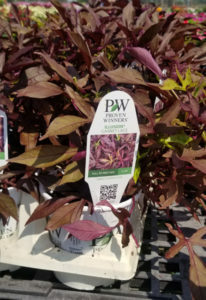 Some plant labels now feature a QR code you can scan with your phone and can view a great deal of info on the plant. Commercial growers are able to offer a great deal of advice on the care of plants with this technological development. Simply download a QR code reader app. Like most apps that I use, it’s free. 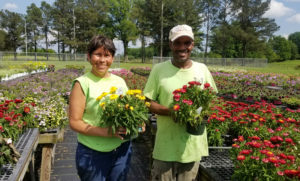 I visited the Baddour Garden Center in Senatobia, Mississippi, to talk with those experts about what to plant and how to make it last all summer and through most of the fall. They offered so much helpful advice! For more information on this retail and wholesale center, see the link at the end of this article. 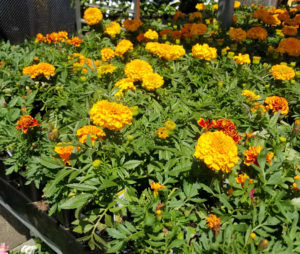 Marigolds, lantana, salvia, petunias, geraniums, vinca, and tropical hibiscus are stunning in sunny locations. 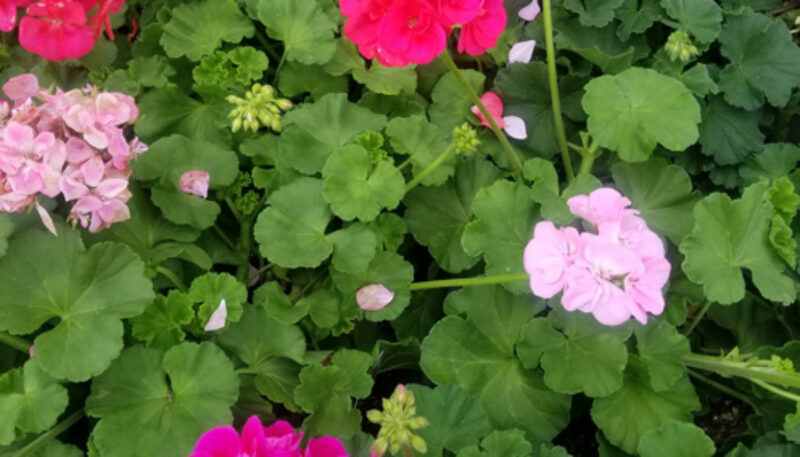 The Baddour Garden Center advisors said that Proven Winners brand plants they carry have roots with improved water retention, they last longer in the heat, and they seem to bloom more profusely. Compost mixed with the soil and mulch applied to the soil surface help to retain moisture. Make sure the mulch particles don’t rest against the plant stems. For details on the advantages of different types of mulch, see my blog, Mulch or Pine Straw – The Pros and Cons. These flourish in shady locations but will still do well with a little (I repeat, a little) sun: Impatiens, green leaf begonias, and coleus. Many varieties are available of each. 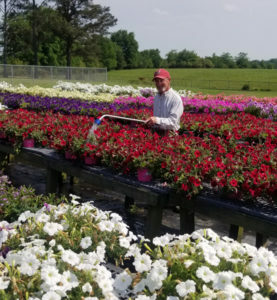 These three highly acclaimed bedding plants are called the “bread and butter” of annuals, or selections that last for one season and don’t regrow automatically the following year. Several popular perennials, plants that return each year, are Coral Bells heuchera, yarrow, hostas, and astilbe. These have small to medium blooms for a short time, but their long-lasting, richly-colored foliage is what many homeowners love the most. I also took the opportunity to ask the garden center staff about one of my blooming shrubs that didn’t fare well since our family removed two trees that shielded them from the afternoon sun. My once-lovely hydrangea bush wilted last summer after hours in the summer sun and appeared to have burned spots on the leaves. Their suggestion was that it needs to be moved, but, ideally, not now. They said they don’t ever recommend moving a shrub once the hot weather arrives, but that if I don’t think the plant will make it through another summer, then I may have to move it or lose it. On the subject of wilting – I asked about drought-hardy flowers or green plants that look great with shrubs in flower beds and flower pots and will stand up to hot days. They said that good choices for drought hardiness are caladiums, liriope (monkey grass), and begonias. Another is the Silver Falls dichondra, cascading foliage that’s perfect for hanging baskets, containers, or as a ground cover. Diamond Frost euphorbia doesn’t mind at all our Southern heat and dry days. It looks like a delicate plant but is as tough as nails. Other choices are ravishingly beautiful, but watch out for these water-lovers – impatiens, petunias, and hibiscus: They demand moisture – or else! From the Baddour gardeners: “What we try to create is a 3-D effect, with varying heights of tall, medium, and low plants. It’s a blended image, and your eye is not drawn to one spot. Contrasting colors make a beautiful statement, especially in containers. We have a black petunia called Black Beauty that’s outstanding when mixed with white or yellow flowers. Another standout is the deep purple Night Sky petunia. It looks like someone splattered it with paint.” Varieties with good texture around flowers are monkey grass, low junipers, sweet potato vine, and ferns. Personally, I love to mix a variegated (green and white) green plant with flowers or solid green foliage. The gray and white tones of dusty miller are an interesting contrast to plant among the flowers. If you want to enjoy your summer bedding plants until cold weather arrives in the late fall, continue to monitor water needs and fertilize monthly. Give petunias and begonias a haircut when they get “leggy” (bare stems and few leaves left) makes the root regenerate to produce new stems and fill in leaves on shorter stems. I usually have to throw out my waning front porch ferns right after Thanksgiving to make room in the containers for Christmas trees. When my plants last until November, I feel that I certainly got my money’s worth for the season! 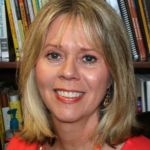 Amy, thanks for reading! I appreciate hearing from you. Thanks Sharon, I’m going to go buy some Miracle Grow bloom Buster soon! You could still fertilize to keep plants healthy until fall, but give them enough water, too, during the hot months.